U-Md. journalism students Karen Carmichael and Jamie McIntyre try to explain why Takoma Park has so many locally-owned businesses in this ten-minute video, posted to YouTube late last month. In the beginning, it sounds like another screed against commercialism. Carmichael calls a CVS in Takoma, D.C. a "chunk of suburbiana" (doesn't she know that making up words is only for English majors? ), while McIntyre, a former CNN correspondent (wait, what?) contrasts cutesy Old Town Takoma with Olney, which he claims "could be Anytown, USA" for its many chain stores. The video has interviews with owners of local mainstays like Mark's Kitchen and the House of Musical Traditions, though Carmichael and McIntyre can't get them to say why Takoma Park is able to do what it does. "The first thing you notice in Mark's Kitchen is . . . it's not Starbucks," one talking head opines. 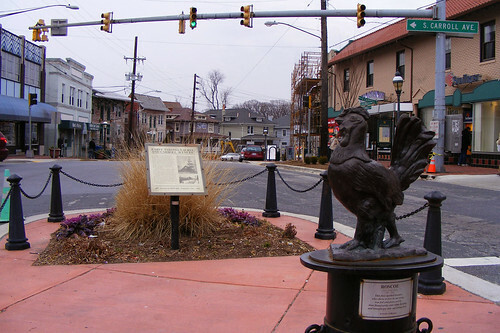 Roscoe the Rooster, Takoma Park's mascot, sits in the shopping district. As much as I enjoy a local coffeeshop, I doubt many people outside of Takoma Park walk into to one and marvel, "Wow, what a locally-specific, non-homogenized experience!" What Carmichael and McIntyre don't explain is that Takoma Park can sustain so many local businesses because they're organized into one unified destination. Stores are close enough that people can park once and walk around, meaning they can rely on each other for customers and marketing - not unlike stores in a mall. 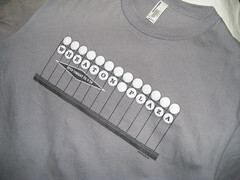 And like a mall, Takoma Park benefits from branding - for instance, from its long history of liberal politics. Sometimes, it manifests in negative ways, like vandalism of a Subway franchise on Carroll Avenue six years ago, whose owner is also interviewed in the video. But it also results in a focus on artistic pursuits - a music store, a vintage clothing store, a bakery - and preserved historic buildings that lend it a feeling of authenticity. But cutesy Victorian storefronts can only go so far. At the end of the video, McIntyre suggests Takoma Park could do better. He goes to Ellsworth Drive in downtown Silver Spring, where he points out that successful business districts often have a high density of people (living there and/or working there) and are easy to walk around. Takoma Park's nice to walk around in, but difficult to reach if you don't already live in the neighborhood. 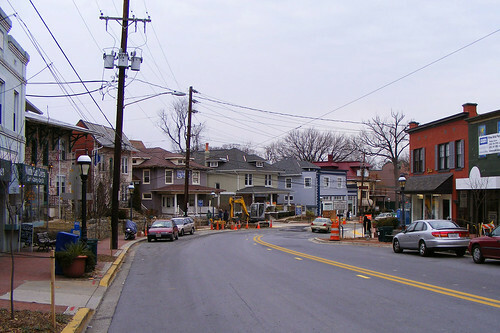 Takoma Park is a joy for pedestrians, but it's not very dense, meaning that businesses cannot rely solely on people who can walk to their stores. At the same time, Takoma Park is difficult to reach by car, and though there's a Metro station nearby, it can be a long, hilly walk to either of its business districts. These impediments will discourage people from shopping there, and no shortage of ad campaigns will fix that. In the past, some Takoma Parkies have opposed new housing in the area, like this proposed development at the Metro station. 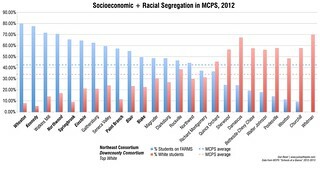 But if they'd like to retain its mom-and-pop businesses, they should push to have it built. It's a good lesson for neighborhood business districts in East County and beyond: if you want people to shop in your stores, you have to get them there. And it's often easiest to get them there if they already live in the neighborhood.